Nationalism isn't obvious in Montenegro. Besides the lack of a native currency or postage, we don't see anything else that proclaims Montenegro as an independent entity, not even a flag. In the past, Montenegro distinguished itself as the only Balkan nation to remain independent of the Turks. 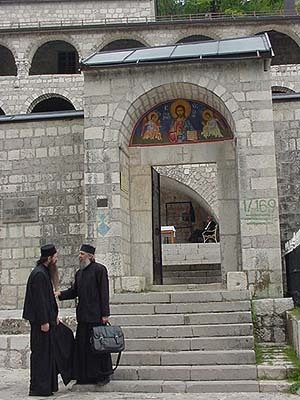 Bishops led the country from 1482 until Europe recognized a Montenegrin monarchy in 1878 that ruled until Montenegro joined Yugoslavia as a republic after World War I. We can't simply ask somebody, "Hey, is Montenegro independent or what?" so we must assume that the divorce from Serbia is a delicate matter that takes time to evolve. 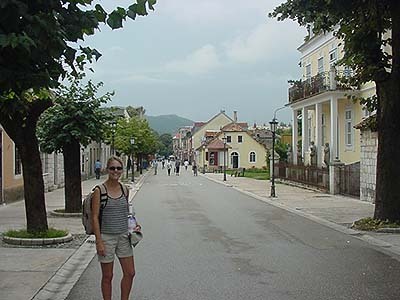 History is one of Montenegro's best nationalistic assets, so we visit Cetinje, the old capital. Since it's basically a three street village, it's almost unbelievable that the international community established many embassies here at the turn of the 20th century. Bishops ruled Montenegro for hundreds of years, carrying a holy book in one hand and a sword in the other to fight off the Turks. Now they carry brief cases. 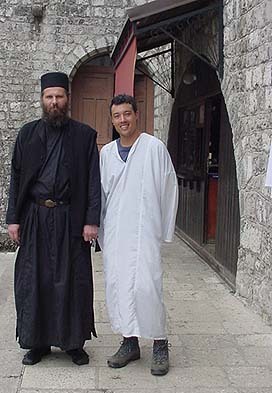 Priest apprentice (Montenegro Orthodox) for a day.